Former street kid, Ruby McKinney reaches out to runaways through her medical clinic in the worst part of the city, but her escalating battle with a gang leader puts this work in jeopardy. Tom Masters, Ruby’s first love, is now on the right side of the law and at the center of a dangerous DEA sting involving her clinic. Tom’s disappearance ten years ago broke Ruby’s heart and rattled her faith. As their romance rekindles, memories of what it cost to love him flood her with fear. As Ruby’s battle with the gang ignites a firestorm of danger and betrayal emerges from within her own camp. With Tom’s life in the balance and her world cast in shadows, can Ruby trust God as she once did…or has she strayed too far to ever return? I should have known to stay away from dark corners. Nothing good ever happened to me in them. But it was my job to look, and it was a good thing I did, because the ghost I found that night belonged to me. In retrospect, the asphalt and the blood seemed fitting, considering my start in life. A broken child found abandoned in a bus station. I was eight years old and newly born. I lay unconscious for two days in the I.C.U. No memory of who I was, or who hurt me so badly ever came. I simply blinked into existence one morning. 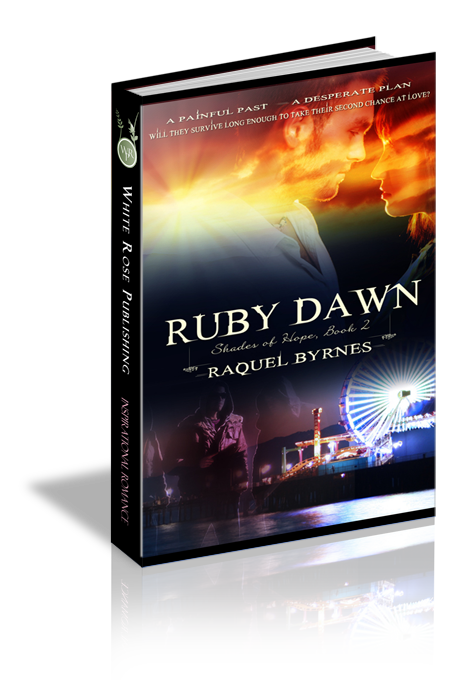 The nurses named me Ruby Dawn, after the color of the morning sky the day I opened my eyes. I grew up on the streets outside various foster homes. Never quite comfortable in the unfamiliar houses or with the well intentioned, I often stayed out until it was too cold or too dark to remain under the sky. I don’t think I ever left the streets I roamed as a child. That is how I came to be outside the old brownstone this frigid winter evening. The last stop on my daily route, I parked the beat-up sedan against the curb. Peeling back the duct tape that held the glove compartment closed, and reached for a flashlight. Catching sight of myself in the rear view mirror, I frowned. I tried to tuck my hair back into a ponytail and smooth out my bangs. My eyes looked pale and tired. My shifts as an ER resident, coupled with the time running the free clinic were taking their toll. I rubbed my eyes and got out of the car. I pulled some donated coats from the passenger’s side seat and started down the sidewalk. Munch and Joe, old men ravaged by life on the streets, huddled close to a trashcan set ablaze in the alley. They recognized me walking towards them and hid their liquor. It was their version of cleaning up for company. Joe smiled at me with vacant gums, and Munch waved. His gravelly voice echoed in the filthy alley like a kicked tin can. “Hey Munch, Joe, how’re you guys holding up tonight?” I forced a cheerful smile. “Aw, you know.” Joe shrugged in his layers of suit blazers and sweaters. All his clothes eventually took on the same color as the asphalt. He was shivering, but smiled. “Weatherman…only job on earth you get paid for bein’ wrong most a’ the time.” Munch waved his hand dismissively. “Whatcha got there, Ruby?” Joe craned his neck to see what I was carrying. “Nothin’ wrong with what I got on.” Munch wrinkled his nose at them. Joe shrugged, but I saw his tongue snake out and lick his cracked lips. He was interested. He wouldn’t take charity, but he’d take a wage for a job. “Aw, that store only gives out food vouchers for clothes.” Munch wrinkled his nose again. Actually they paid cash, except to people I sent in. Anyone who came in with something marked with my initials, got vouchers for food, not cash. I wasn’t interested in supporting the local liquor store. “Special, how?” Joe’s eyes lit up. I shrugged and made a mental note to drop off a case of something special at the shelter tomorrow night. “I’ll bet its pudding. Man, I love that chocolate pudding. Those cups don’t need no fridge.” Munch smacked his lips and took the coats from me. Something at the far end of the alley crashed against metal trash cans, making me jump. The movement in the shadows looked human. I thought I saw a prone figure flail in the shadows. Concerned it might be a kid in trouble, I looked closer. I pulled the heavy steel flashlight from my backpack and shined the beam down the alley. The light bobbed with my shaking hand. I crept forward. A man writhed on the ground holding his side. I flashed the light back up to the top of the fence he must have just scaled—no one there. I walked towards him, gritting my teeth to quell the fear bubbling in my chest. “Hey, Ruby, don’t get too close.” Munch called from behind me. I turned to shush him, and then the man moaned. “P-police…call,” he gasped between groans. He reached a hand out to me; it was covered with blood. My heart thumped in my chest. I took another step towards him, the flashlight beam quivering across his body. He lay on his side, his face bruised and covered with grime. “You’re a cop?” I gasped. He nodded and tried to sit up. I yelled back down the alley at Munch and Joe. I leaned in to help him, and then the beam of light hit his face. I pulled back reflexively. Green eyes under dark brown eyebrows stared back with shock. “Ruby?” he stammered. “Tom, where have you been? What happened to you?” I grabbed him by his shirt and pulled him into a hug. Breathless, I laughed nervously. He groaned in my arms. I looked at the pain on his face and let go. He smiled, and it looked like it took all of his strength. I wiped my eyes and helped him to his feet. We staggered to the mouth of the alley. Tom groaned with the effort. Officer Farrell rounded the front of the cruiser and pulled open the back passenger door. Covering the top of Tom’s head with his hand, he helped guide Tom onto the back seat. “Dr. McKinney, are you OK?” Officer Farrell asked me. His gaze ran over the blood on my hands and shirt. “I can’t go in under my own name. Call it in, but don’t use my name. I’m DEA,” Tom gasped from the back seat. “Buddy, I have you covered,” Farrell replied. Tom turned, his face pale in the car’s interior light. Breath ragged, he held his hand out to me from the back seat. I climbed in next to him, and Farrell slammed the door shut. We tore off towards the emergency room with lights flashing. Tom’s eyes fluttered closed for a second, and my chest tightened, panic soaring. I shook him and he started. “You know, I never said sorry,” he breathed. I pulled my scarf off and wadded it up, pushing it against his bullet wound. Sticky warmth oozed between my fingers. Sobs welled in my chest. “Don’t start.” My voice cracked. He reached up and ran his finger down the bridge of my nose. He’d done it a thousand times before, a lifetime ago. I wouldn’t look at him. I couldn’t, not without crying. “You did what you had to do.” I pushed on the scarf. “Do you still hate me?” He winced through the pain. “I am sorry, Ruby. I…” Tom’s eyes fluttered, closed mid-sentence. Praying desperately, I held him while we flew through the streets. Lights flashed past the windows, and my heart ached so bad, I struggled to breathe. Tears trailed down and landed on Tom’s dirty wool cap. I cried because I’d lost him before and couldn’t bear to do it again.